Kandy is Sri Lanka's second largest city, and generally thought of as the island's cultural capital. It's grown up around a misty hill in lush tea plantation country, and is artfully arranged around a central lake. 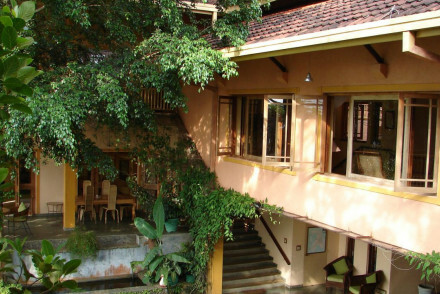 Many of the best places to stay in Kandy can be found in the mountains surrounding the city. These often charming guesthouses benefit from panoramic views of this photogenic city. This was the capital of the last Sinhalese Kingdom, which defied the Dutch and the Portuguese for three centuries until it finally fell to the British in the 19th century. And there's something proud, defiant and regal about this city still, from the carefully displayed national treasures to the beautiful architecture of the colourful houses. The Royal Palace is one such example, a gorgeous piece of architecture. If you want to immerse yourself in local culture and history, be sure to check out the World Buddhist Museum and the National Museum of Kandy. Busy and colourful, in Kandy you'll be surprised by impromptu street markets, sudden tropical rain storms and the deliciousness of the food. Kandy is also one of the best places to stay in Sri Lanka if you want to get close to an elephant. There are numerous elephant spotting tours and safaris, and you can get closer still at an elephant orphanage, like the one at Pinnawala. And it's close to the Temple of the Sacred Tooth, one of the most sacred places in the Buddhist world. Explore the city's amazing street markets! Go on an elephant-spotting safari. Immerse yourself in regional history at the National Museum of Kandy! Visit the Temple of the Sacred Tooth, one of the most sacred places in the Buddhist world. Check out the World Buddhist Museum, a fantastic charting and detailing of the religion through the ages! Go for a round of golf at the world-famous Victoria Golf Course on the outskirts of town. 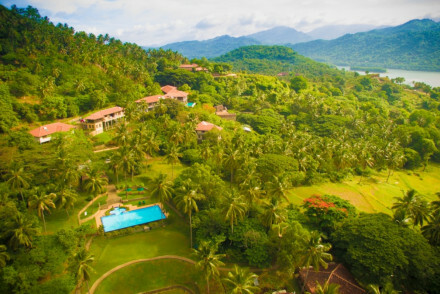 Our pick of the best places to stay in Kandy include a couple of options in the town itself, plus a colonial hideaway located by the famous Victoria Golf Course. Victoria Golf and Country Club: boasting villas, cottages and chalets, this hotel is in a beautiful location swamped by exotic trees and on the edge of a golf course. Decorated in chic styles and offering gorgeous views, it is amazing value for money. 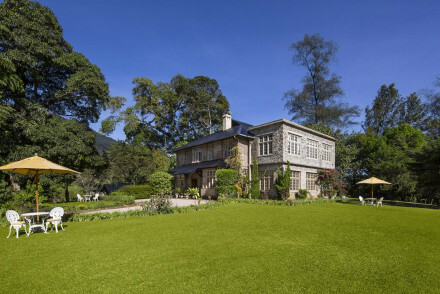 Ashburnham Tea Estate: an authentic and intimate stay, this charming little boutique is set in a 1930s tea plantation. Explore the tea terraces, relax by the pool or enjoy a cooking lesson at the restaurant. Grea for couples looking for a true experience. 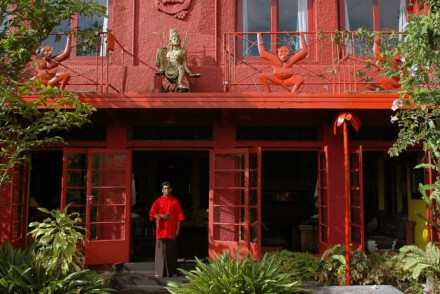 Helga’s Folly: Helga's home was built in the decadent 1930s, and she's retained many of the original features, including the building's particular shade of red, both inside and out. She's also added murals and historic paintings, photographs and a collection of unusual antiques - that kind of original. Helga swans around day and night, accompanied by jazz and swing music, watching over the visitors staying in her 40 rooms. You'll love it or loathe it, so even though it's really close to the Golden Temple, make sure you look at the photos before you book. Clingendael: For a spot of pure luxury, look no further than here. There's only four rooms, so it feels like your very own piece of paradise! Located on the Victoria Golf Course, it offers rooms decorated lovingly with sumptous traditional fabrics and teak furniture. Taylor's Hill: in an enchanting spot in the tea plantation mountains, this wonderful colonial house is decorated with a bold mix of antiques and modern design. Surrounded by beautiful and lush gardens, it is ideal for couples looking for intimacy. 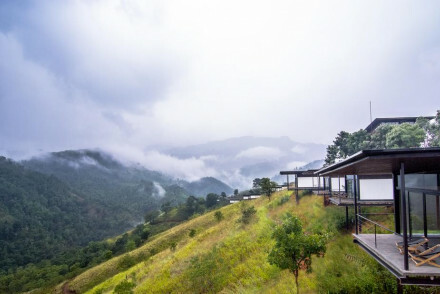 Santani Wellness Resort & Spa: a beautiful and modern wellness centre standing high on the hills above Kandy. Guests are given a specialised, uniquely-designed health plan, the rooms' clean and minimalist design, much like the exterior architecture, creates calm and intimacy. 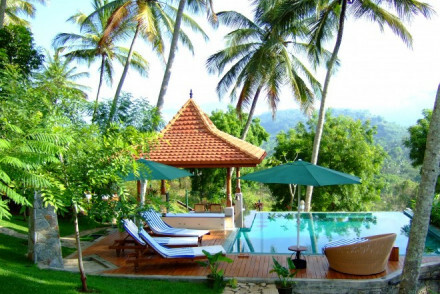 Our partner Booking,com has a wide range of villas and apartments in the nearby area. Visit between December and April, when the weather is at its driest and warmest - otherwise you will be in the raging heart of a monsoon. Fly to Bandaranaike International Airport in Colombo, get a train from Colombo Railway Station to Kandy. Alternatively widen the net and check out all our recommendations in Sri Lanka. Villa Rosa is one of Kandy’s hidden gems. A green oasis of calm perched 600m above sea level. Colonial styled rooms feature beamed ceilings, dark antique furniture, elegant four poster beds and warm hues. Feast on exemplary traditional Sri Lankan cuisine. The ideal spot to completely unwind. Hideaway - A tranquil rural retreat boasting stunning views of the surrounding countryside. Sights nearby - Visit Kandy's famed Temple of the Tooth and explore the botanical gardens. Basil Fawlty meets Kubla Khan in Helga Blow’s decadent chic home. A red 1930s building surrounded by jungle. Dark muralled rooms full of historical paintings, photographs and antiques. Home cooked food and a well stocked bar. A truly eccentric stay that should be on everyone's 'to visit' list. Writing a novel - Quirky and fascinating- every inch is covered in paintings, frescoes, sculptures etc reflecting the hotels artistic life. Sights nearby - Visit Sri Lanka's most important Buddhist relic the Temple of the Sacred Tooth Relic. Great walks - Wake up early and take a leisurely stroll aound Kandy Lake. Delightful 1940s accommodation jam packed with period furnishings. Set amidst its peaceful surroundings it is a wonderful little retreat. Cosy rooms feature capacious four posters plus there is an inviting pool. Cooking classes or meals cooked by the head chef are a treat! Families - Plenty of activities plus children under 10 stay free! 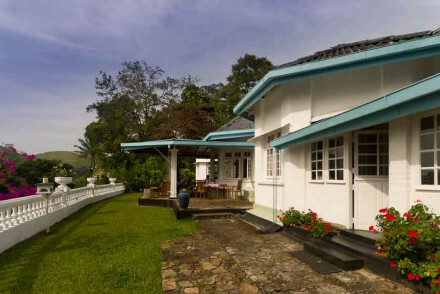 A picturesque old colonial country house, in the Kandy mountains tea plantations. The five rooms have been lovingly decorated with a bold mix of antiques and modern design. Both the Sri Lankan and western food is exceptional. An enchanting and secluded spot surrounded by lush gardens. 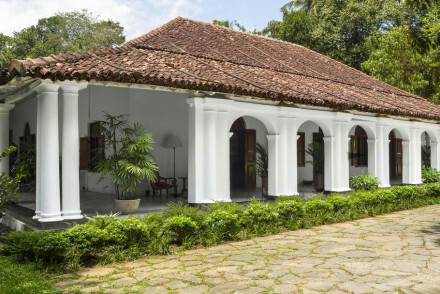 Kandy's first luxury boutique hotel, housed in an 1804 walauwa on 6-acres of lush gardens. Interiors have been beautifully restored, marrying traditional materials and features with contemporary minimalism and style. The food is haute-Sri Lankan cuisine crafted from local ingredients. Unbeatable. 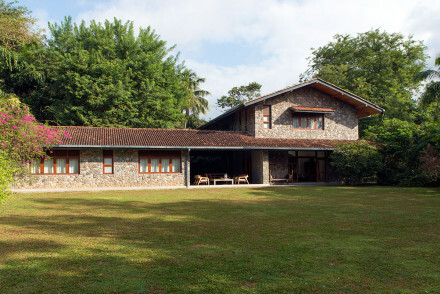 A contemporary wellness centre situated in the picturesque hills above Kandy. The clean architecture is not only very pleasant on the eye but also helps create a zen like atmosphere. With healthy meal-plans and blissful wellness packages created for each guest this is a truly special place. Total relaxation - A mountain setting, first-class spa, minimilist design and child-free destination. What could be more relaxing? Spa breaks - A destination spa complete with with comprehensive hydrotherapy facilities. Sights nearby - Visit the golden-roofed Sri Dalada Maligawa temple which houses one of Buddha's teeth. Great walks - Take long walks through the properties 48 acres of jungle and rice fields. An intimate, colonial hideaway located on the world famous Victoria Golf Course. Decorated with beautiful teak furniture and sumptuous fabrics for a traditional luxurious feel. Cuisine is classic Sri Lankan with Asian & European gourmet offerings too. Plus cocktails with a kick!